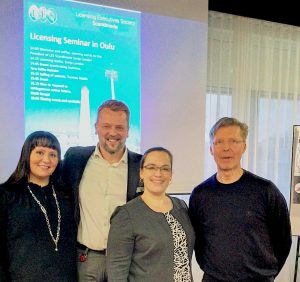 The Licensing Seminar organised by LES Scandinavia was held this year on 19th November 2018 in Oulu, Finland. The President of LES Scandinavia, Sonja London, opened the event and held a very informative presentation on the Licensing basics. The afternoon was continued with another interesting presentation, Brand accelerating business, by Taru Kallio-Nyholm. Tuomas Matila led the audience into the world of patent selling. He enlightened the topic by comparing selling used cars to selling patents. Selling patents is not as easy as selling used cars! But something similar however, in both you need to have good quality and find the right market segment to sell. The afternoon seminar was completed by Matti Kauppi giving the audience advice on How to respond to infringement notice letters. The quality of IPRs was highlighted as one of the keys responding the infringement notices as well. These great presentations led to lively discussion that continued in more informal evening event. The Greip team was present the seminar and the team members found the event as an excellent opportunity for IPR professionals to add insight on how to utilise the IPRs and why the quality is super important. Tuomas Matila, Sonja London and Matti Kauppi.